Planning a road trip around The Great White North? Book a Canada holiday package deal and save on airfare and accommodation prices. Whether you're organising a family trip abroad or spoiling your loved one with an incredible romantic getaway, a holiday package is the best way to save time and money without sacrificing on quality. Webjet curates the best specials from leading airlines and hotels to ensure you're getting excellent value for your money. Enter your travel dates, choose the deal that suits your budget, and you're on your way to exploring Canada's pristine landscape and cosmopolitan cities! Start searching the latest Canada holiday packages from Australia with Webjet's powerful search engine. No matter where you live in Australia, you can get a flight to any of Canada's major cities. Sydney, Perth, Melbourne and Brisbane all have routes with airlines such as Air Canada, China Eastern, United Airlines and Qantas. The cheapest route is usually from Sydney International Airport (SDY) to Vancouver Airport (YVR). The total flight time is 22 hours, but the journey can take up to 48 hours depending on your airline and stopover destination. The Sydney to Vancouver route is currently one of the only Australia-to-Canada connections with a non-stop flight. Common international stopover locations include Los Angeles, Dallas or New York City. 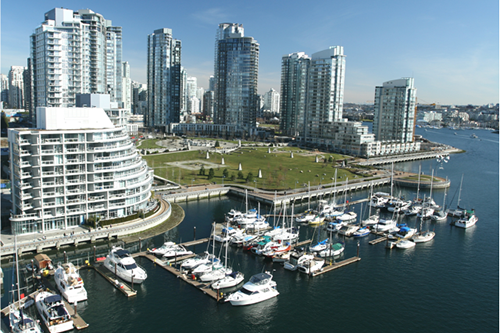 Depending on where you’re heading within Canada, you may also have a layover in cities such as Vancouver. If you're travelling to Canada on a budget, fly into the country's smaller international airports. Kelowna (YLW), Victoria (YYJ) and Ottawa Macdonald-Cartier (YOW) are some of the most affordable airports in the country. Canada holiday packages have accommodation options for every kind of budget. Book a room with well-known luxury brands such as the Four Seasons, or opt for more affordable options like the Comfort Inn. Located in downtown Vancouver, the Shangri-La Hotel is a sophisticated city escape. It's within walking distance of top attractions as well as the vibrant art and shopping districts. Stay in one of their tastefully decorated suites and have dinner at the on-site restaurant or grab a meal from the many nearby restaurants. Want to experience award-winning hospitality? Thompson Toronto was voted the top hotel in the city at Condé Nast Traveler's 2018 Readers’ Choice Awards. Enjoy panoramic views of the sprawling metropolis below at the Rooftop Lounge while you cool off from the summer heat in the pool. Inside the rooms, you'll find floor-to-ceiling windows and boutique hotel furnishings accented with burnt orange and white decor. Discover Montreal by living like a local. The Place Jacques Cartier Apartments are spacious, furnished and feature a fully-equipped kitchen and private terrace. The city's top attractions are close by with the beautiful Notre Dame Basicilla only a five-minute walk away. Stock up on food at the Bonsecours Market or sample traditional Quebec food at the city's top restaurants. The Great White North is the second biggest country in the world. It boasts an endless amount of breathtaking landscapes, hiking trails and wildlife. But Canada isn't just an excellent outdoor adventure destination; it's also home to an array of vibrant cities. In fact, Calgary, Vancouver and Toronto are on The Economist's list for the global top ten most livable cities. Located inside the Yoho National Park, the Emerald Lake is an awe-inspiring destination. The best way to explore the surrounding area is with a canoe. Hire one from the nearby lodge, and you'll have this natural wonder all to yourself. Just make sure you plan your visit around the summer months when the frozen lake melts, and the colour of the water is at its most intense. If you're visiting Canada during whale season, make your way down to Vancouver. You can sign up for a tour on the city's icy waters to get up close with large pods of orcas, humpback whales and minke whales passing through the waters. Keep an eye out for other marine life such as seals, sea lions and birds enjoying their natural habitat. Ever wanted to see polar bears in the wild? Plan a trip to Churchill! It's called the "Polar Bear Capital of the World" and is located in the sub-Arctic region of Manitoba. The best time to visit is during the October and November migration when hundreds of bears come to hunt for their favourite meal: ringed seals. The best time to visit Canada is between September and November. Temperatures are cool but comfortable, and the summer crowds have left the major cities. It's easy to find cheap Canada accommodation and flights packages, and you'll be in time for all the autumn celebrations. June to August is high season in Canada. While you will have to pay more for flights from Australia, you'll have excellent weather for outdoor activities. Make sure you book early if you're visiting hotspots like Vancouver or Toronto. Canada's cold winter months shouldn't be avoided. If you can brave the weather, you can try your hand at some of the winter sports or attend the winter festivals. Those wanting to hit the ski resort towns such as Whistler or Banff will need to book Canada holiday packages or ski specials well in advance to secure the most affordable rates.